Once upon a time in a far away land (New York) there was a record company named Bell Records. Bell had two children named Amy and Mala. Between the three labels, many great soul singles were produced in the late 60s. Bobby & James Purify's "I'm Your Puppet," The Box Tops many hits including the original of "The Letter," later covered by Joe Cocker, the incredible Oscar Toney Jr. with a string of great recordings for them, and the soul group The Van Dykes with the mega hit "No Man Is An Island." Papa Don Schroeder was a deejay in Pensacola who caught Sam McClain's live act and brought him to Rick Hall's Fame Studios in Muscle Shoals, Alabama. 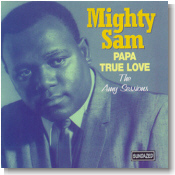 Schroeder produced many of Sam's early records (hence this release's title), and the rest is history. Many great tunes written by Dan Penn and Spooner Oldham came out of this period (see the Irma Thomas review last month for more on them) and a soul/blues icon was born ... Mighty Sam, known to us all now as Mighty Sam McClain. In reviewing his latest Telarc release I had hoped that some enterprising record company would release this early material, and here it is, thanks to Sundazed Music. In addition to this 18 track Mighty Sam release, they also have releases on the aforementioned Box Tops and Van Dykes and a fine re-release of Solomon Burke's 1969 Bell LP Proud Mary, which we will discuss in a moment. First let's touch on the Mighty Sam release. Recorded between the years 1966-1968, and released only as singles, these tracks make their first U.S. appearance as a complete collection (there was a British LP released in the 70s). Those of us fortunate enough to have heard or for that matter purchased these unbelievable 45s such as "I'm A Man," the Don Gibson tune "Sweet Dreams (Of You)," and the often recorded "Talk To Me, Talk To Me," will be eternally grateful to have all this music again. Those of you that enjoy Mighty Sam McClain's recent output owe it to yourselves to get a copy of this release, not only hear this legendary singer early in his career, but also the gospel driven music that arose out of the formative years of Deep Soul. Solomon Burke had a slew of single hits for Atlantic Records in the early 60s. He left Atlantic in 1969 to record Proud Mary for Bell records. This re-release gives us that LP in it's entirety and seven non album tracks. Listening to this album of mainly cover tracks (there were only a few new tunes), you immediately become aware of how a great singer can make a familiar song into his own. I was in awe listening to his cover of "In The Ghetto," which really seriously challenges Elvis for the finest version of that song. Covers of "What Am I Living For," Otis Redding's "These Arms Of Mine," and "Please Send Me Someone To Love" all are quite enjoyable. But it is "In The Ghetto" and wonderful versions of "That Lucky Old Sun" and Sam Cooke's "A Change Is Gonna Come" that make this a worthy re-issue, but not as indispensable as the Mighty Sam release, which will be a shoo-in for many top10 lists this year.